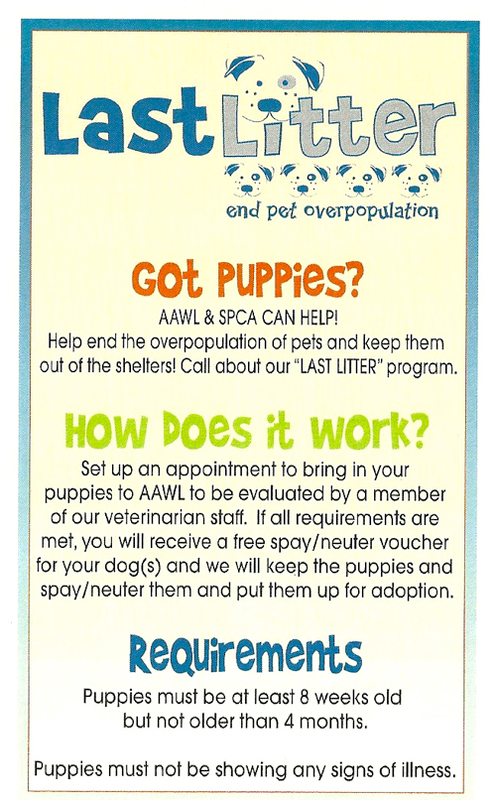 Have an oops litter and don't know what to do? Puppies must be at least 8 weeks old but not older than 4 months and not showing any signs of illness. You set up an appointment to bring in the puppies for a quick vet check and evaluation and if all requirements are met, you are provided a voucher for a free spay and neuter for your adult dogs. We will keep the puppies and put them up for adoption. If this sounds like something that would help you out of your situation or if you have a friend or family member who may be in this situation please contact our intake team at intake@aawl.org for more information.